Changing to energy-saving LED light bulbs isn’t easy. It’s tricky, technical and $$$$. Here’s my story. Last Spring I began looking for ways to make our house more energy efficient through insulation and other energy saving measures. New York State has an excellent home energy conservation program and through the NYSERDA website I was able to locate a contractor to do a free home energy audit. Many states have similar programs offering rebates and low-cost loans to homeowners willing to insulate, upgrade the furnace and install more efficient LED light bulbs to help lower electric bills. 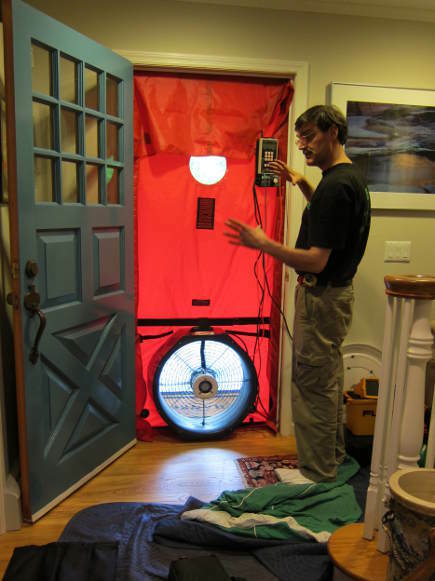 The contractor I chose, Bill Mc Knight, of Energy Conservation Specialists, arrived with his infrared camera and blower-door apparatus to determine how much air was leaking out of our house, and where. He inspected the attic, the basement and tested the furnace. With a passion for energy-saving that’s really contagious, he’s a dream contractor – skilled, knowledgeable, generous with his time and attention to detail – always on the lookout to help his clients save. “You know,” he said pointing to the GE Reveal incandescent floodlights in my ceiling cans “you could reduce your electric bill by 30 percent if you switched those incandescent bulbs to LED light bulbs.” Bill also warned that the LEDs were expensive, but worth it because they ran cooler (on low voltage), used less electricity than fluorescents, and would not need replacement for many years. I had no idea there were LED light bulbs made for ceiling cans. On my own, I had previously purchased a dozen dimmable compact fluorescent floods – about $12 each — and hated them. Even worse than the smaller compact fluorescent bulbs I’d tried three years ago when I wrote my original post on making sense of light bulb color, they gave off sickeningly greenish-yellow light. They didn’t dim – they died – and caused my switches to malfunction. I moved them to closets and the basement where there are no dimmers. The light output remains abysmal in those dark places. $144 plus tax was badly spent and fluorescent bulbs cost $1 each to recycle! Inspired by Bill’s suggestion, I bought two LED light bulbs as a test. 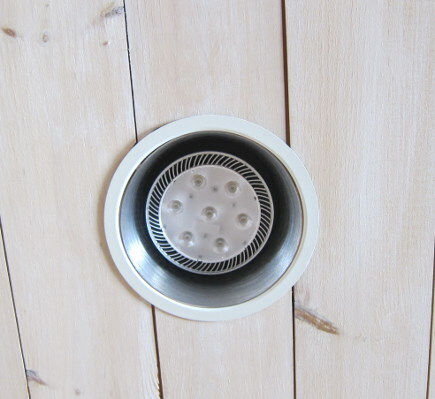 My ceiling cans take PAR 38-size bulbs (4.75-inches in diameter) which I found out from a sticker up inside one of the fixtures. The bulbs I had been using were smaller than they should have been. 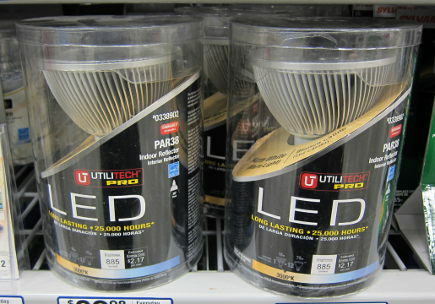 At Lowe’s, I found dimmable 3000K (warm white) Utilitech brand flood lampss (Lowe’s proprietary brand made by Feit), equivalent to my incandescents at 885 lumens (brightness). For $30 each they are guaranteed for 25,000 hours or about 3 years (8760 hours in a year). That means each new LED adds $11.50 a year to my electric bill for three years before I use a kilowatt. Ouch! But the light is wonderful and even brighter and cleaner than the incandescent bulbs. So I invested an additional $70 to put four in my home office ceiling, where lights burn 12 hours a day. 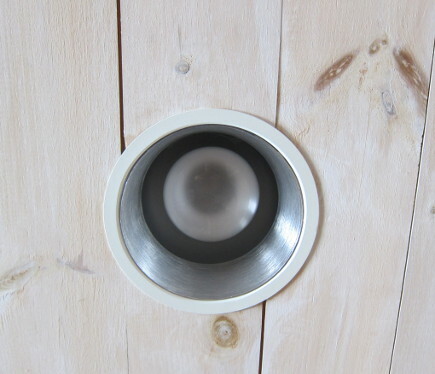 What I also like about these bulbs is that the bezel, or outer ring, is very narrow. So there is a maximum light spread from this bulb style. Good solution? Almost. With all four bulbs replaced, the lights didn’t dim and my switches didn’t work. 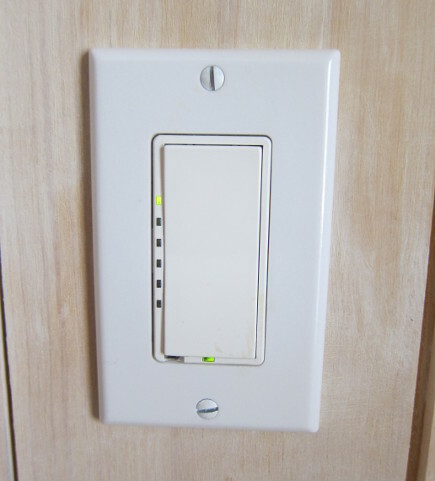 Our ten-year-old Leviton dimmers are great. I love their tiny green lights to show where the dimmer is set and they are a cinch to find in the dark. But LED light bulbs put out low voltage vs. the high voltage the old switches use. So I constructed a workaround — mixing one incandescent with three LEDs — which resolved the problem. Following the successful mix, I replaced 3 of 4 bulbs in Mr. AM’s home office and 6 of 9 bulbs in the kitchen – two other daily high-use areas. My electric bill did go down slightly but who knows how long it will take to see a $420 savings to cover the cost of the bulbs? Two of the LED bulbs burned out within three months and I returned them to Lowe’s where they were replaced at no charge. Had I bought online I’d have been out of luck. • Every dimmer must be replaced with a new LED-compatible switch. This requires an electrician. • To keep the switch style I like, there is a single choice: Lutron Maestro. This is a top-of-the-line option and Lutron offers specialty choices including “occupancy sensor” switches that turn themselves off (rebate bingo) and remote-control infrared switches (no getting out of bed up to turn off the lights). That cost would be about $2000. And those switches only are guaranteed work with certain lightbulb brands. • A majority of the LED bulbs range from semi- to totally hideous. Note to manufacturers: automotive styling does not cut it!! My Utilitech bulbs are less visually offensive than most. 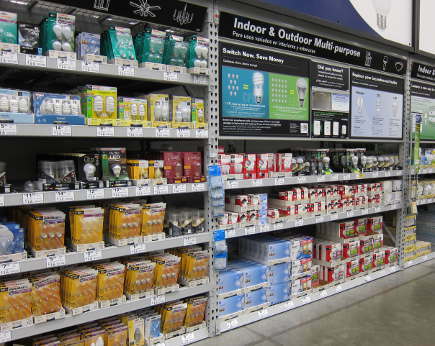 The choice of LED bulbs and brands is brain-boggling. 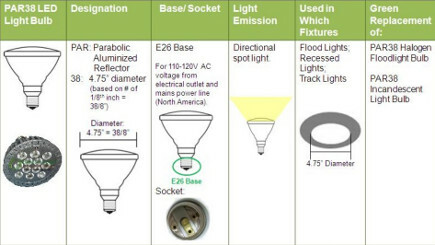 Fair warning: special attention must be paid to bulb design and especially to the surface area including the bezel (rim) thickness, the beam pattern (wide or narrow), the shape, size and socket type. Floods spread light down and at an angle all around. I look for a narrow bezel and an even pattern of diodes over the surface to get the widest spread of light from each bulb. A thick bezel and diodes only in the center is a bulb that works like a spotlight. This chart I found [above] is a handy reference guide. Despite my sincere intent to lower the energy footprint of my house, the fast-moving new technology isn’t standardized or completely compatible with new or old fixtures. That means there’s no cost-effective solution for my house very soon. Retrofitting all the switches and all the bulbs would cost several thousand dollars before there is a penny of savings on my electric bill. Plus, I still have a supply of old bulbs to use up. I’m pleased to have made a start. Meanwhile, making sense of switching to LED is ultimately a matter of dollars and cents. I hate this! Not your article–that was quite informative! What I hate, is this light bulb situation we are trapped within. And I do mean trapped. I love my incandescent bulbs. I love the light they give. I love the cost compared to the LED. I like that they work with the dimmer switches we paid to put in as we upgraded and renovated the various rooms in our house. Did I mention I love the light that they give??? We have HD/Ecosmart(?) LED bulbs in our entryways (front door and garage). No dimmers there, at least, but I don’t like the light they give nearly as much as that from my old bulbs. Plus, I am not a fan of the slight delay between hitting the switch, and the bulb lighting up. We have a Halogen IR (?) bulb in an upstairs hallway. It was recommended by a GW’er. It’s okay. I would try another one, or a brighter one, but can’t seem to find it online again, and don’t recall where I’d gotten this one. I am not a government-basher, but I really do think this is one case where the powers-that-be were extremely shortsighted; “outlawing” the incandescent bulbs before there were really GOOD alternatives available to the masses (and aren’t budget-breaking!). Plus, the incompatibility of many or most of these newer bulbs with existing (original) dimmer switches is inexcusable. Sorry for my rant. I am not against energy-savings, but I truly believe this should have been thought out better, and phased in more slowly while the technology “caught-up” to our needs. Interesting and informative! I H.A.T.E. fluorescent bulbs. My theory is that they save energy, because by the time they come all the way on, you’re done in the room and have turned them off again. Yuck. So dim, too. LEDs are nicer, but for the price! Interesting that keeping one incandescent allowed your dimmers to work… Clever! @catmom – we are most definitely in one of those times when some of the basics are changing but are not fully changed and it’s just a mess. So I totally get where you’re coming from on this and, obviously share it to some extent as I wrote. Buying a lightbulb should not require what this requires — for sure.I do, however, like the brighter cleaner light my LEDs give. For me, it’s a better color than the incandescents that were too yellow and the Reveals that are pink. But the bulbs are not standardized nor is the dimmer technology. I think this is like phones — used to work great, be clear and easy. Now it’s all chopped up, hit and miss and you have to game the whole thing. Then they change it again. The problem is, that even if you are willing to do an upgrade it’s an investment that may never pay off. And in the end, you can’t just change the bulbs or you get the delays etc. The switches must be changed. Then there’s the task of figuring out if you actually are saving any money on the electric bill. But since the usage varies from year to year, who the heck can tell? 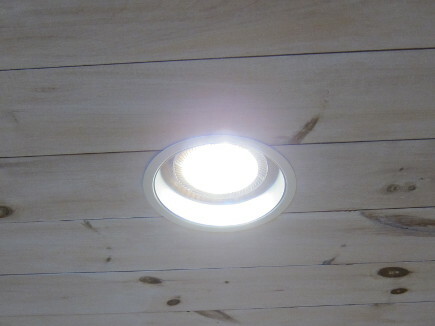 @rhome – I have a really nice fluorescent fixture in my laundry room that gives off a ton of bright white light. The garage got new ballasts and bulbs and the light has really improved in there. But those are the bulbs we’ve had all along. The new compact fluroescents just don’t give off enough light be useful in a small closet. There ought to be a law!! I also agree with you cat mom. I love my incandescents. While I am delighted to hear that it sounds like there may eventually be options that give a beautiful light, we are so not there yet. And I’m not convinced about the longevity being such a great factor with LED’s. Incandescent bulbs on dimmers last longer. In fact, we are only now starting to lose, one by one (and we’ve only lost three out of 15 or so) incandescent ceiling bulbs installed 7-8 years ago. While reading, I expected to hear that LED’s have a lifespan of like 15 years! Seven? not impressed. I’ve already got that. And if I had to replace all the dimmers in my house I’d a) go broke and b) pull my hair out. No thank you. But this was a very interesting article and like I said, it does sound like hopefully, the industry will get there. In the meantime, I’ll be hoarding a few more incandescents.